Warfarin is useful as a treatment for patient who is at risk of developing thromboembolic events. 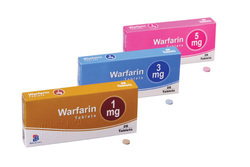 Warfarin is considered in patient who develop atrial fibrillation and after performing hip replacement surgery. Warfarin may interact with other drugs. Some of these drugs such as rifampin or barbiturates may increase the metabolism of warfarin which may decrease the anti coagulant effects of warfarin. Some of these drugs such as cimetidine may potentiate the anti coagulant effect of warfarin by inhibiting the metabolism of warfarin. Warfarin react by inhibiting vitamin K dependent gamma carboxylation of factor II, VII, IX and X as well as protein S and protein C which present in the liver. Warfarin shows a slow onset of action with long half life. Warfarin is useful as anti coagulation drugs. The efficacy of warfarin is monitored by using the PT. The common side effects of warfarin may include changes in the skin such as bruising or bleeding which can be treated with fresh frozen plasma or vitamin K.
Warfarin carries its own teratogenic effects and should be avoided in case of pregnancy.